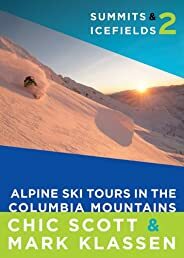 This new edition of Summits & Icefields 2: Alpine Ski Tours in the Columbia Mountains continues RMBs tradition of offering snow enthusiasts updated editions of our bestselling guidebooks. Researched and written by legendary alpinist Chic Scott, with the assistance of certified mountain guide Mark Klassen, this guidebookalong with its companion volume Summits & Icefields 1: Alpine Ski Tours in the Canadian Rockies (RMB, 2011)will continue to be the bibles for ski mountaineers looking to experience the winter grandeur of western Canadas mountain ranges. Completely revised and updated, this new edition will feature both classic and new tours, along with information on a variety of locations that has either been greatly expanded or freshly redone, including the ever-popular sections on Rogers Pass and the Bugaboos to Rogers Pass Traverse. With stunning, full-colour photos throughout and featuring digitally shaded maps prepared from satellite imagery, these new editions will set a unique standard for ski guidebooks in North America.